From 2 till 9 July, two people from the national news on the public network are gathering news in the village. From 21 July, the national news will broadcast 4 3-minute-specials about the consequences of climate change in the arctic. Marieke de Vries and Hans Struik are enthusiastic about the opportunities in this village. 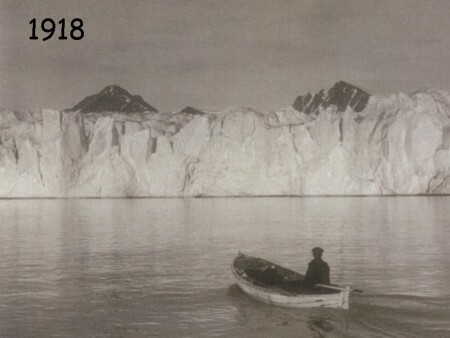 Together, we go searching for a spot where a photo from a glacier was taken in 1918. The glacier has shown a spectacular retreat. We all are impressed by the change, but aklso by the beauty of the site, the rumbling of falling ice in the glacier and the amount of blue icebergs in the fjord. 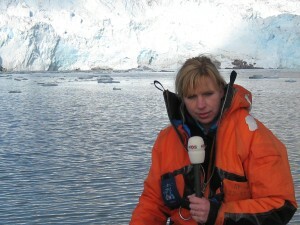 More about calving glaciers can be found here. Why are there so many foreign stations in this village? 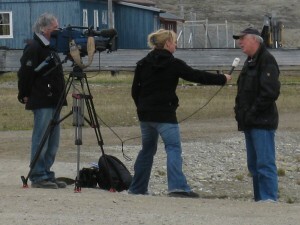 Marieke interviews Oddvar Midtkandal, director of Kings Bay and me as station manager of the Netherlands Arctic Station. Earlier I have heard them talk about the length of Oddvar. How can you have some scenery instead of blue air behind the man while filming? On the left picture, you can see the solution. Place the director on the vulnerable tundra and film from a high point on the road! 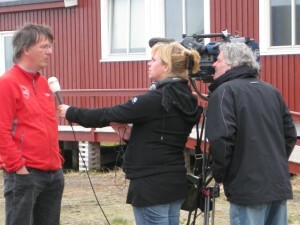 Janwillem is interviewed for the special news for children. He tells about his research on arctic foxes. In the evening broadcast there is a whole item from 0:26 till 0:50 and 6:50 till 9:10 minutes. You can view the Dutch broadcast by clicking here. During the afternoon, there is a short announcement from 3:00 til 3:40, which can be viewed here . Mark Serreze and Nick Owens were still in town because of the Ny-Ålesund symposium. Carl Petter Nielsen is checking the weather and tells about insects. Polar bear footage from a cruise around Spitsbergen. 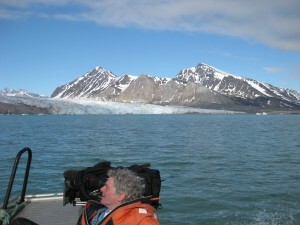 Maarten Loonen takes the journalists to a spectacular retreating glacier. Predictions on large amounts of oil cause new dreams. Why are there so many international research stations on Spitsbergen? This page has been given the following keywords: [video] You can click on each keyword to get an overview about related pages.